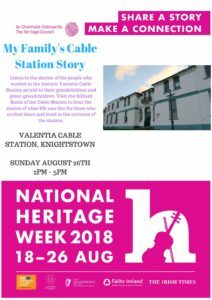 On Sunday August 26th 2018, the Cable Station hosted a Heritage Week event reflecting the stories of the people and families who worked in the Valentia Cable Station. Joe McGill of Radio Kerry moderated a panel which included John Lyne, electrician in the Engine Room; Nono O'Donoghue; Teresa Curran, childminder in the Cable Terrace; Micheal Lyne, historian and Foundation Board member; and Gordon Graves, great-great-grandson of James Graves, the first Superintendent of the Cable Station in Valentia. The talk will be broadcast on Radio Kerry's Saturday Supplement on September 15th 2018. As part of our Heritage Week activities, we asked grandchildren and great-grandchildren of those who worked and lived in the Cable Station to interview their relatives about Cable Station and island life at the time and you can find those interviews below. We would like to invite anyone who has a family connection to the Valentia Cable Station to contribute a recording of their family's story - please email karen.oconnell.work@gmail.com if you would like to submit your recording. A huge thanks to Joe McGill, all the contributors on Sunday August 26th and those who recorded interviews.